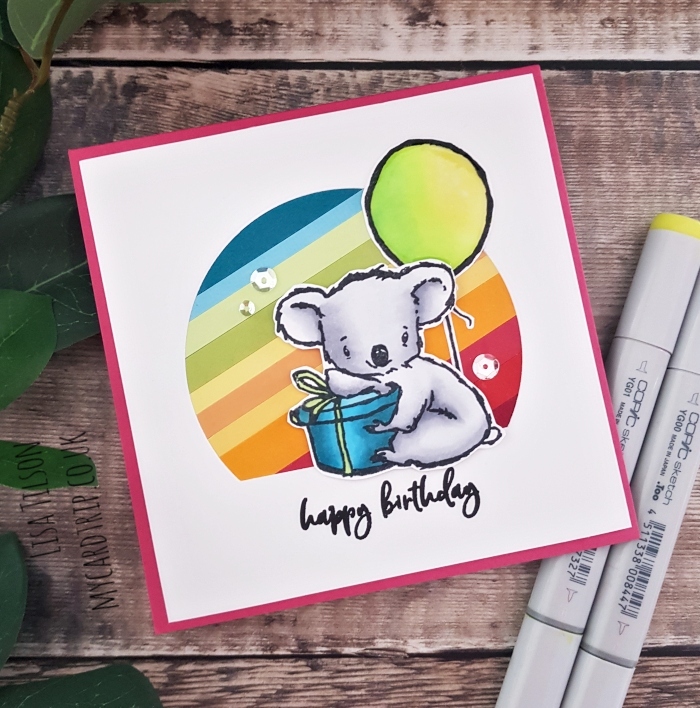 Hello there, today I am sharing a fun and colourful birthday card with you. 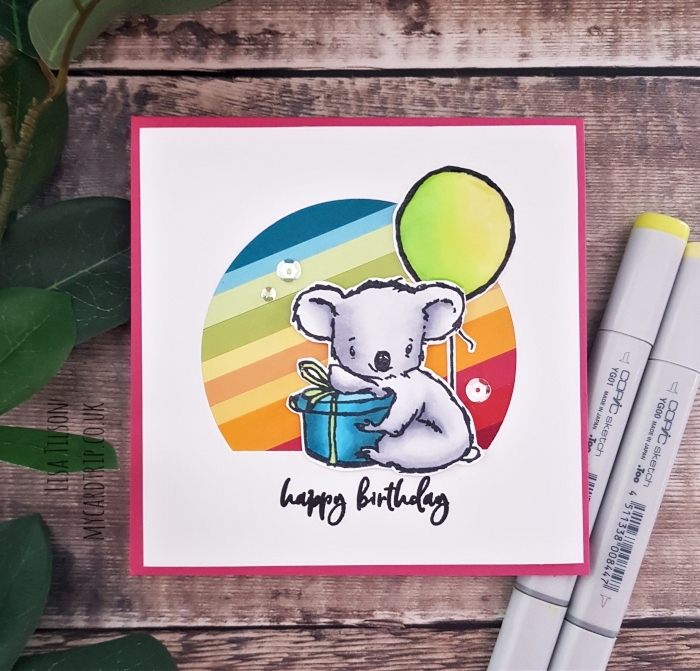 I mean what can be sweeter than a birthday koala and a stripey rainbow background? Today’s card features one of the sets I was set recently by Picket Fence Studios. 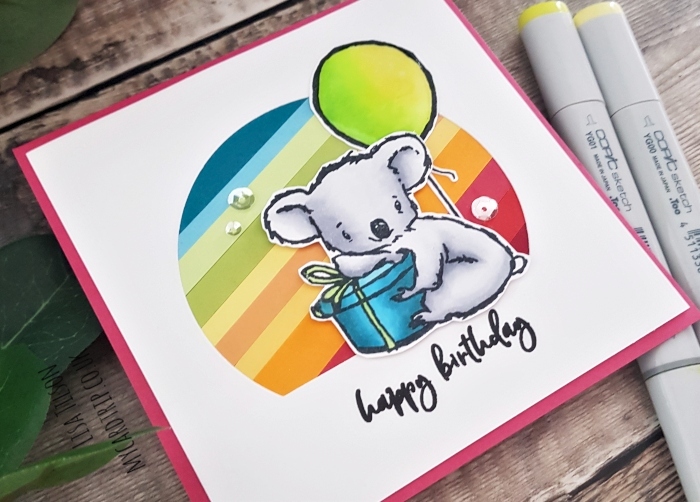 It is called I wish We Could Hug and it has some beautifully drawn koala images, one floating with a balloon, one sitting with a present which I used below, and another hugging a baby. 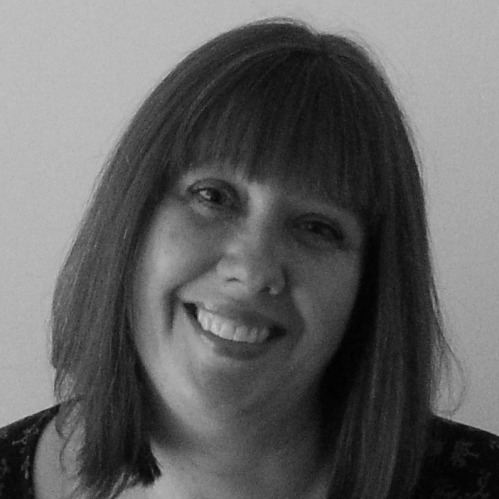 They have a very sketchy feel to them – bold, graphic outlines and they are a great size for colouring. I began by taking the koala with present image and stamping it onto Neenah with Picket Fence Hybrid Black Ink. I also stamped the balloon portion from a separate image in the set. I coloured both with Copics and then fussy cut them out. The Copic numbers are listed below. Next I took a white panel and die cut a window using the MFT Stitched Arch Stax die. I used Versafine Onyx Black Ink to stamp the Happy Birthday at the bottom as this is a lovely crisp black, ideal for greetings. This sentiment is from Picket Fence’s Kylee Boo set. For my background, I adhered different width strips of coloured cardstock to a white panel and then trimmed the panel so that it would fit behind the arch window. To assemble the card, I created a 5″ x 5″ square base card from pink cardstock and adhered the rainbow panel to that and the white window panel on top. This was all with DST so it’s quite a flat card to start off. I then popped the koala up with foam tape and the balloon with wet adhesive. To finish the card, I added Tonic Nuvo Aqua Shimmer to the present and balloon and then Tonic Nuvo Crystal Glaze to the balloon. A few sequins from Lucy’s cards were added for a little extra sparkle. It’s hard to see the sparkle and shine in the photos sadly. That finishes today’s card and I hope that you like it. Such a sweet image and I think it would be hard not to smile if that arrived on your birthday. Thank you for stopping by and I will see you all again soon. Happy crafting friends!